Hi, if you love chocolate, then you’re going to go crazy over this Chocolate Fudge Bundt Cake. There’s melted chocolate in the fudge cake and melted chocolate drizzled over. 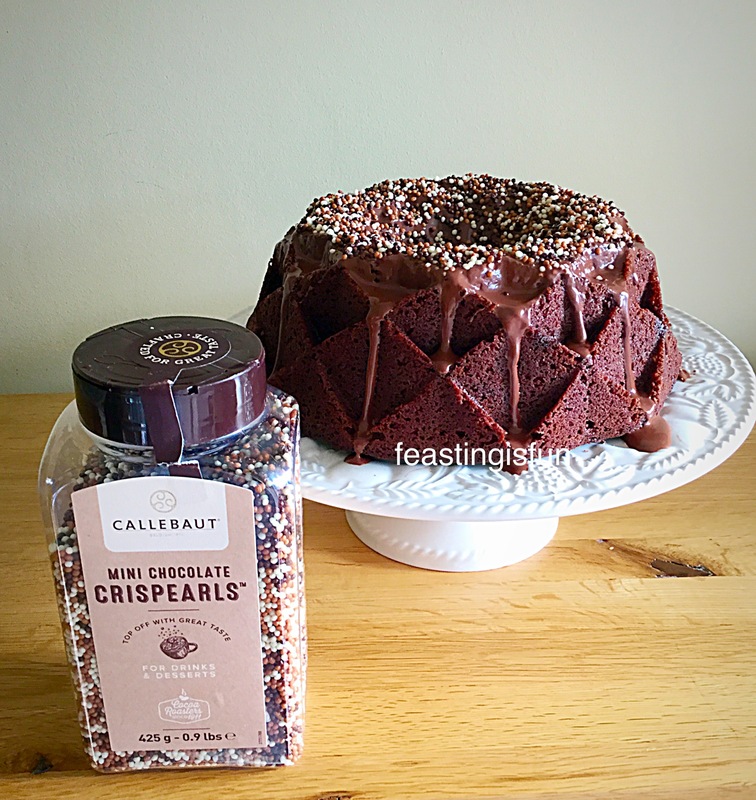 Topped off with a generous sprinkle of Callebaut’s Chocolate Crispearls. Chocolate Fudge Bundt Cake drizzled with melted chocolate and topped with mini chocolate crispearls. I love Bundt tins. I really do. They take a great cake batter and without any help from the baker, turn it into a beautiful cake. That has got to be a very good thing, right? 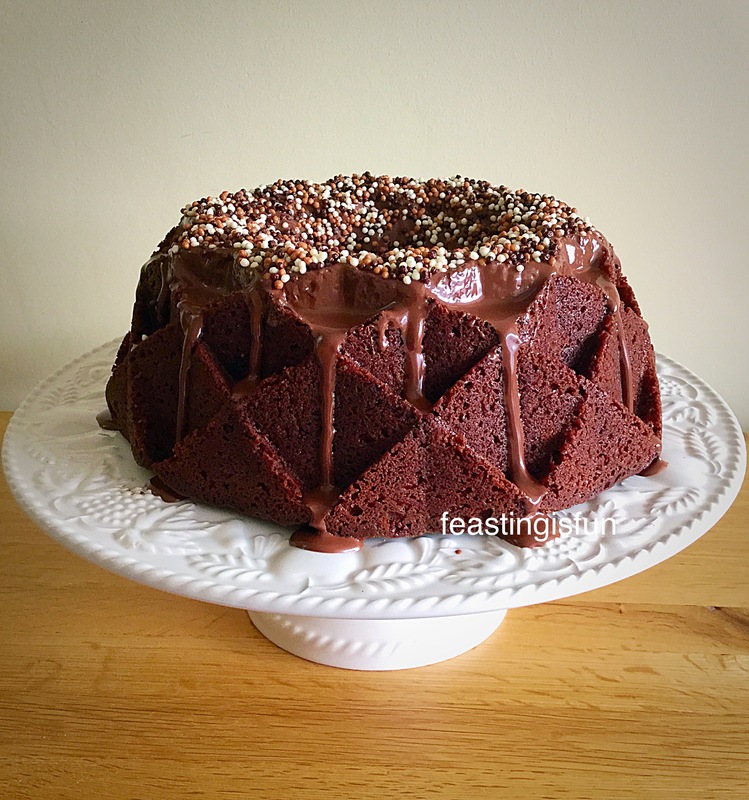 The tin I used for this Chocolate Fudge Bundt Cake is called the Jubilee Bundt made by Nordic Ware. I tend to buy my Bundt tins in the sale, or where I see them on special offer. They can be a bit pricey, but investing in just one tin, like this Jubilee, will give you a lifetime of intricately patterned cakes. 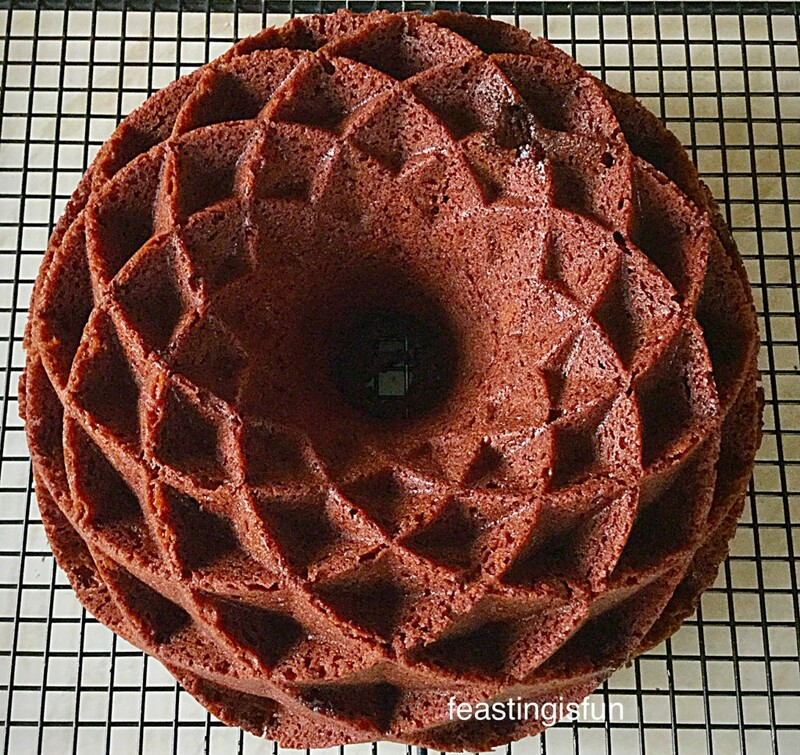 The Jubille Bundt Tin from Nordic Ware. Can you imagine rocking up to a party with this gorgeous cake? Yep, huge brownie points and that’s before anyone has tasted the cake! 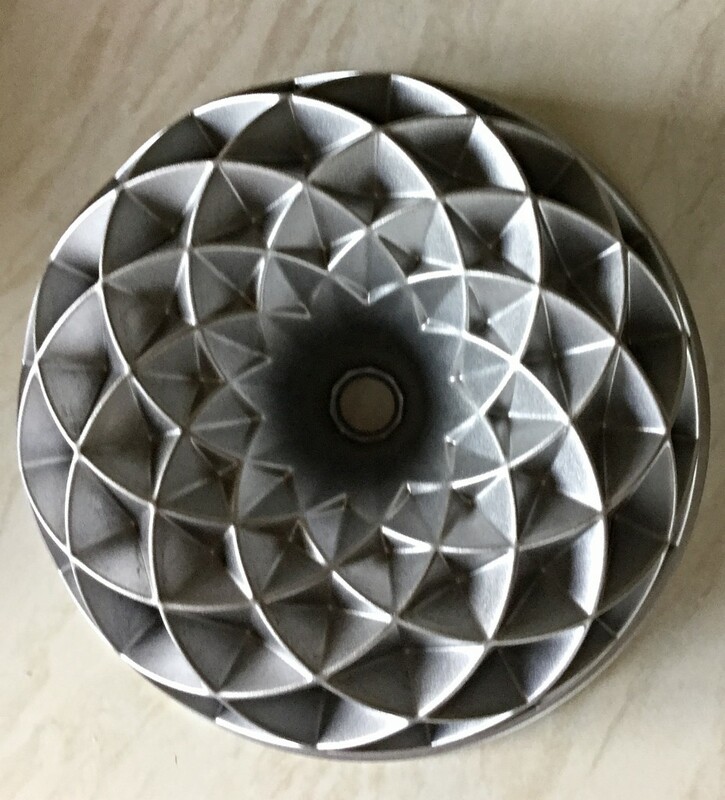 I will warn you though – Bundt tins are addictive. A year ago I had one, now I have ten!! Put the kettle on and enjoy every single bite of this Chocolate Fudge Bundt Cake. If you, or someone you know loves chocolate cake, then this is the cake to bake. 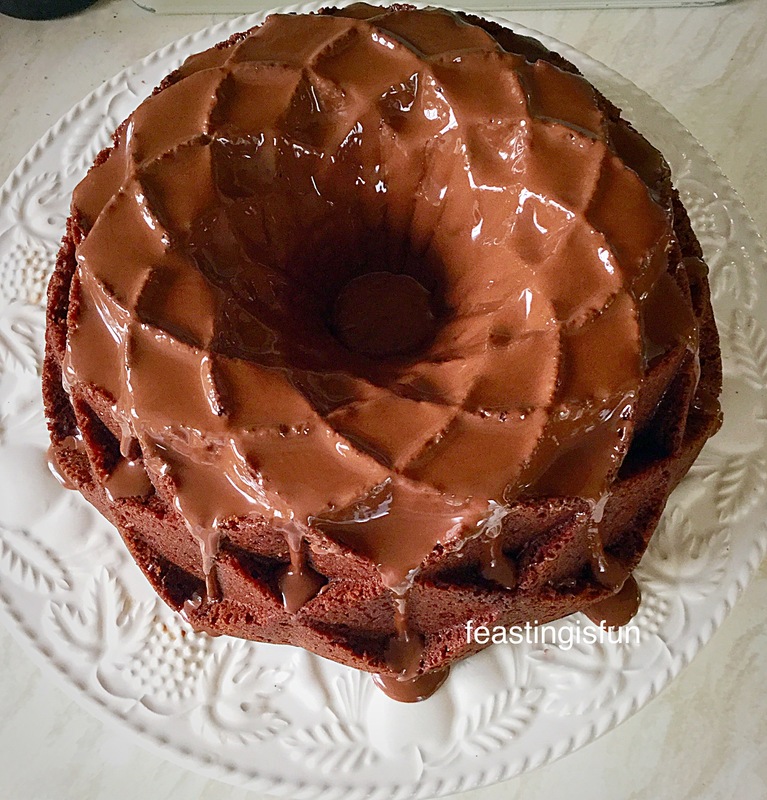 And because I appreciate not everyone owns this gorgeous tin, this Chocolate Fudge Bundt Cake can be baked in a 10″ springform pan! Although technically it would no longer be a Bundt cake?? So you get to think a whole new name up for it too! 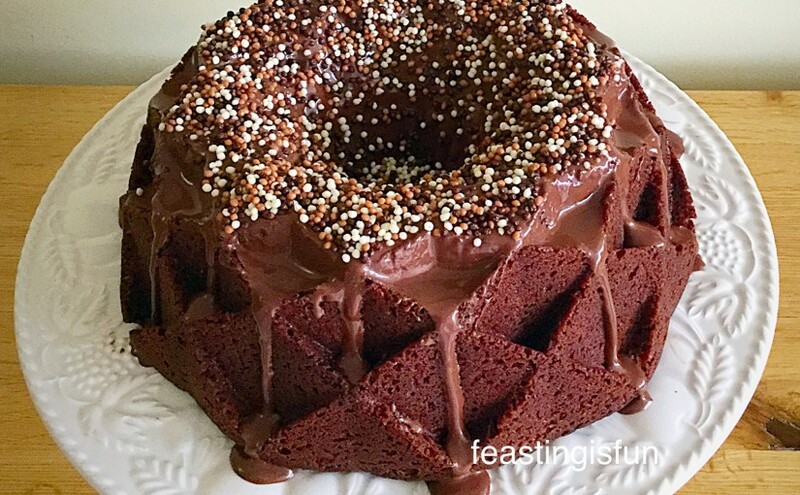 The Crispearls give this moist Chocolate Fudge Bundt Cake a crunchy topping. Just look at this beauty – definitely made for sharing. Now I love a sprinkle or two million. I was sent these Callebaut Chocolate Crispearls to review. They are part of Callebeaut’s hot chocolate decoration range, which also includes, dark chocolate blossoms and dark chocolate granite – more on those last, two in future posts. The chocolate Crispearls are just that, chocolatey and crispy. Perfect for adorning a melted chocolate drizzled, fudgey, chocolate cake. All I can say is, this cake was so good, half had been eaten before dinner. Thats like breaking all the rules (kidding) in our house. Life is too short to not have dessert before dinner on occasion! Yep we like to push the boundaries in our house 😉. Break or chop the plain chocolate and place into a heatproof, microwaveable bowl. Heat for 30 seconds at a time, stirring the chocolate well. When the chocolate is almost melted, remove the bowl and keep stirring until you have smooth, molten chocolate. Set aside. Into a large bowl add the butter and sugar. Whisk until fully combined, this will take a good 5 minutes. Crack the eggs into a jug. Add the sour cream and vanilla extract and mix. Sift in one third of the flour, baking powder and salt. Whisk or beat slowly. Whilst still whisking add half of the liquid contents from the jug. Repeat the last two steps again. Add the last of the sifted ingredients and gently mix until just combined. Remove the beater or whisk. Pour in the cooled, melted chocolate and immediately stir into the cake batter with a metal spoon. Continue until the batter is a uniform colour. 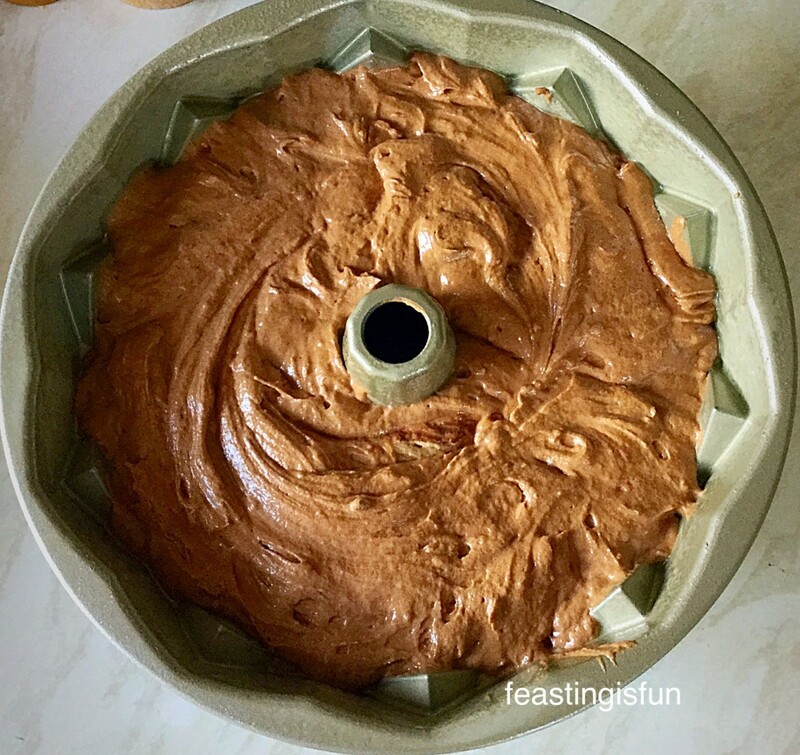 Spray the Bundt tin thoroughly with cake release. Fill the Bundt tin 3/4 full with cake batter. 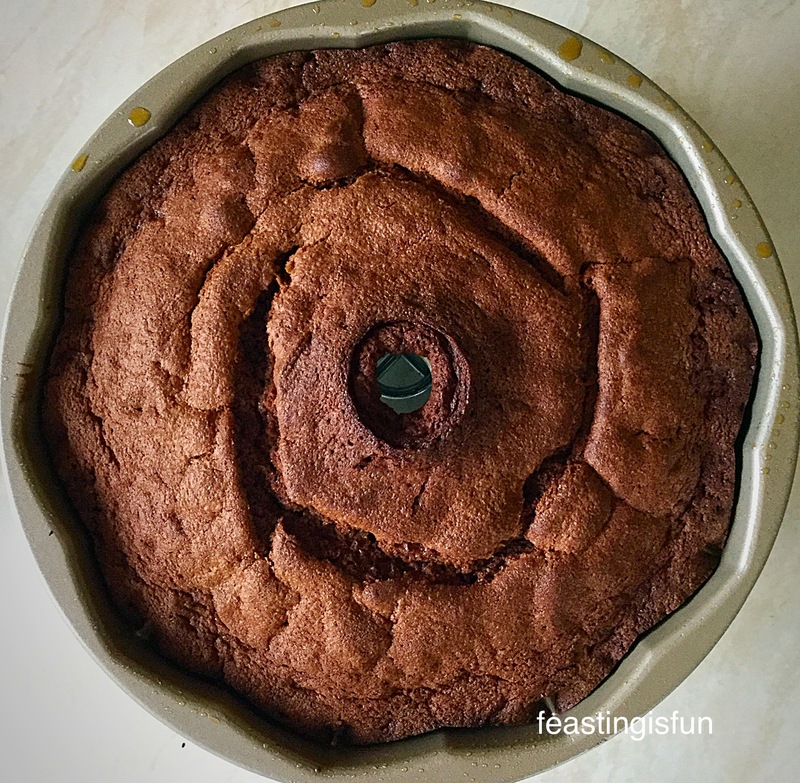 Use a metal spoon to gently press the cake batter into the tin. DO NOT bang the Bundt tin on the work surface, as this could damage the tin. NOTE: There will be a small amount of cake batter left – this can be used for a few cupcakes or bundtlettes. If the tin is filled more than 3/4 full the baked cake may not release and/or the look of the final cake may be spoiled. Place the tin into the centre of the preheated oven. Bake for 50-55minutes. The cake is baked when it springs back from a light tough and an inserted skewer (I use wooden ones) comes out clean. Invert the Bundt tin onto a cooling rack. The cake should turn out immediately. If not leave to cool and the cake will release from the tin. One beautiful Chocolate Fudge Bundt Cake. Melt the milk chocolate as before (for the plain chocolate). Drizzle over the top of the cake using a spoon. I choose to completely cover the top of the cake with melted chocolate and have a small amount dripping down. Take whatever sprinkles you are using and sprinkle away. I kept the Chocolate Crispearls on the top of the cake. 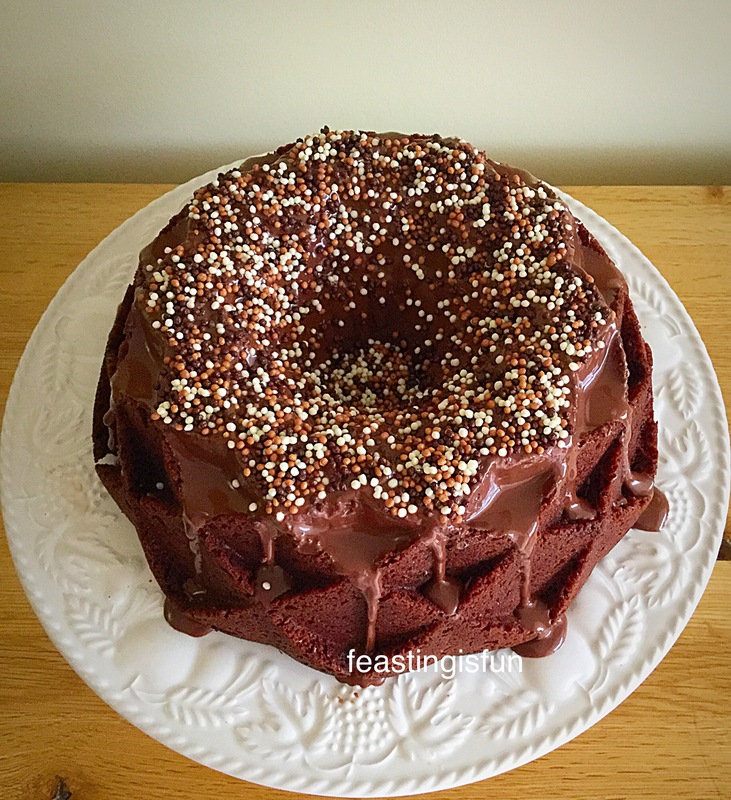 Chocolate Fudge Bundt Cake with Callebaut Chocolate Crispearls. A stunningly beautiful cake, that also happens to deliver superbly on taste. 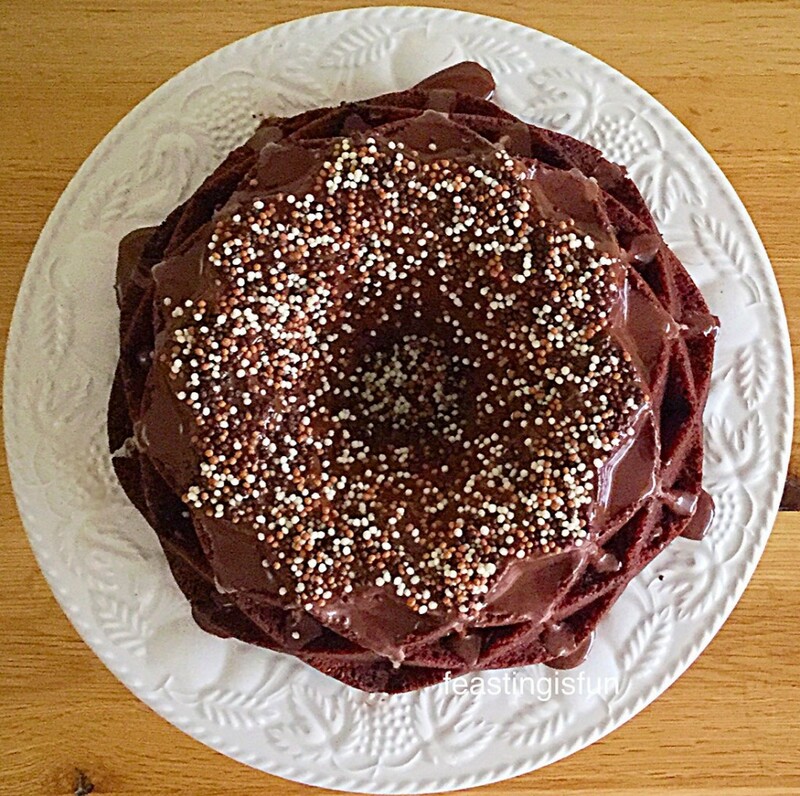 Who will you make this Chocolate Fudge Bundt Cake For? 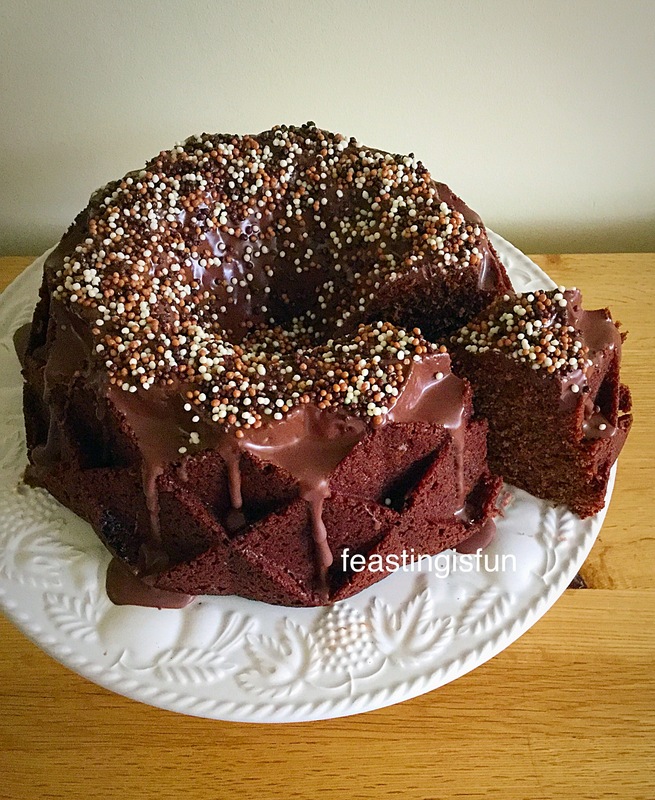 Cut a delicious slice of this Chocolate Fudge Bundt Cake and get ready to share. Such a beautiful cake, it almost seems a shame to cut into it – almost!!! If you have any questions about ‘baking with Bundts’ please either leave a comment, or Tweet me @sammiefeasting. 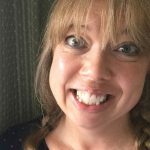 I am by no means an expert, but I’ll do my best to answer your questions. Have fun baking and even more fun sharing! Haha…inspiration can truly be found anywhere! 😉 Happy to help! This cake has my name on it. I can’t wait to make it myself. Sounds terrific. Thank you for sharing.